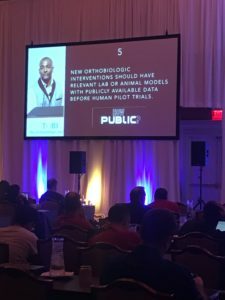 The Orthobiologic Ethics Consortium’s Ethics Statement was revealed at the recently completed TOBI Course in Las Vegas. The TOBI course was founded by Steven Sampson, DO and the presentation was made by Don Buford, MD….both clinicians are early contributors to the Ethics Statement. Good to see that clinical practice is being self regulated by practitioners for patients ‘ safety.